Robert Malcolm Elliot was born on November 8, 1929 and joined the Armed Forces while in Springfield, Massachusetts. He served in the United States Air Force and attained the rank of Colonel. He began a tour of duty in Vietnam on February 14, 1968. Robert Malcolm Elliot is listed as Missing in Action (as of the date his name was added to the Vietnam Wall). SYNOPSIS: Captain Robert M. Elliot was assigned to the 34th Tactical Fighter Squadron at Korat Airbase in southern Thailand. On Valentine's Day 1968, Elliot was the pilot of an F105D fighter jet assigned a combat mission near Hanoi, North Vietnam. The F105 Thunderchief ("Thud"), in its various versions, flew more missions against North Vietnam than any other U.S. aircraft. It also suffered more losses, partially due to its vulnerability, which was constantly under revision. Between 1965 and 1971, the aircraft was equipped with armor plate, a secondary flight control system, an improved pilot ejection seat, a more precise navigation system, better blind bombing capability and ECM pods for the wings. While the D version was a single-place aircraft, the F model carried a second crewman which made it well suited for the role of suppressing North Vietnam's missile defenses. Elliot is among many Americans on whom information is almost certainly held by the Vietnamese, but the Vietnamese continue to deny knowledge of him or of his fate. As reports mount convincing many authorities that Americans are still alive in Southeast Asia, held captive by our long-ago enemy, one must wonder if one of those said to be still alive is Robert Elliot. He may not know that he has been promoted to the rank of Colonel. What must he be thinking of us? The remains of an American serviceman previously unaccounted-for from the Vietnam War have been identified and are being returned to his family for burial in the United States. On February 14, 1968, Elliot was flying his F-105D Thunderchief on a strike mission over Hanoi, North Vietnam, when he was hit by a surface-to-air missile. He radioed to the other pilots in the flight that he had been hit and they witnessed his crash. None of the other pilots saw any ejection attempt nor heard any emergency beeper signals, but one reported seeing a streaming (unopened) parachute at approximately 3,000 feet. In April 1988, the Socialist Republic of Vietnam turned over remains to the United States that they attributed to Elliot. Returned with those remains was his military identification card. Then in 1992, Vietnam provided to U.S. officials several documents related to U.S. losses during the war. One entry was for Elliot. The description indicated that he died from his injuries. In 1994, a joint U.S.-Vietnamese team interviewed residents of the province where Elliot's plane crashed. They took the team to the spot where they had buried his remains in 1968 and subsequently turned them over to their government for repatriation to the United States. With the accounting of Elliot, 2,031 servicemen are missing in action from the Vietnam War. Another 552 have been identified and returned to their families since the end of the war. Analysis of the remains and other evidence by the U.S. Army Central Identification Laboratory Hawaii confirmed the identification of Elliot. The U.S. government welcomes and appreciates the cooperation of the government of the Socialist Republic of Vietnam that resulted in the accounting of this serviceman. We hope that such cooperation will bring increased results in the future. Achieving the fullest possible accounting for these Americans is of the highest national priority. On Valentine's Day in 1968, Billie Elliot's heart was broken. She awoke that morning with the oddest feeling that her husband, Robert, had come to see her, to tell her he was gone. Her daughter, Julie, was crying, having felt it, too. And so when the military personnel arrived to tell her that Robert, a 39-year-old native of Springfield, had been shot down near Hanoi, she felt she already knew. Yet the family was tortured by hints that he had survived the crash and might still be alive. Another American pilot flying that day said he had seen a parachute after Elliot's jet was hit by a missile. Later, villagers said they had watched as Elliot was captured and taken away in a Jeep. Eventually, though, the family's hope began to wane, replaced by a deep and troubling uncertainty. Convinced that the government had not pursued every possible lead, Billie and her four children - who had moved to Hampton Roads, Va., before Robert went to Vietnam - would gather every year in Washington, D.C., for a grim ritual. Documents in hand, they would walk the corridors of the Pentagon in search of answers. Their journey ended this week with a Pentagon announcement. Using DNA analysis and dental records, the Army Central Identification Laboratory in Hawaii said that remains taken from a Vietnamese grave near the crash site are those of Air Force Colonel Robert M. Elliot. "I wouldn't have wanted him to live in prison all these years," she said. "It's been a burden on all of us." It's a burden the family has borne for more than three decades. When the Vietnam Veterans Memorial was dedicated, they spent most of the night at the wall, reminiscing and talking with families like themselves. They joined the National League of POW-MIA Families, where they've learned about technological advances that allowed investigators to find fresh answers in old clues. They've pored over documents at the Library of Congress. They've combed the Internet. The answers, though, came slowly. Robert M. Elliot was due to come home at the end of March 1968, after flying his 100th mission. But on Feb. 14, 1968, his F-105D Thunderchief was hit by a North Vietnamese surface- to- air missile and slammed into the ground. The crash was witnessed by other pilots, one of whom reported seeing an unopened parachute at about 3,000 feet. He was classified as missing in action, but in 1979 the military changed the classification to killed in action. "After he went down, I had a letter every day for five days," Billie Elliot said. "It was eerie. I could tell that he was getting depressed. It was getting very hard on him. He had two planes go down on either side of him, and he had to send things to the families." Then 20 years later came a break, as diplomatic relations between the United States and Vietnam started to thaw. In April 1988, the Socialist Republic of Vietnam turned over 24 bones that they identified as Elliot's, along with his military identification card. But his family refused to take that as the last word. The military told the family that a DNA analysis showed a match, but the results, based on a less sophisticated test than is now available, did not satisfy the family. "We did not feel like we had done everything we could, just accepting those remains," said Kenneth Elliot, 38, the youngest of Robert and Billie's children. "There was always a chance he was alive. There are lots and lots of stories. The only thing we could do as a family was to take that story and research it." As Elliot's family pushed to learn what had happened to him, "one of the only things we could do was absorb information," Kenneth Elliot said. "And one of the pieces of information we absorbed was the O.J. Simpson case." Watching coverage of the Simpson trial, the family learned that a more precise DNA test was available than the one done in 1988. Kenneth and Billie visited a DNA lab in Maryland to learn more and met with military computer simulation experts to pinpoint the site of the crash. In the meantime, the family received tidbits of information. In 1992, Vietnam provided documents to the United States regarding US losses during the war. An entry on Elliot indicated that he died on impact. In 1994, residents of the province where Elliot's plane crashed took a joint US-Vietnamese team to where they buried his remains in 1968, according to information from the Pentagon. In 1997, the family convinced the military to again interview the six pilots who witnessed the crash. Then, in November 1998, military officials agreed to excavate the grave site and send the remains to the lab in Hawaii. Last month, the family was notified that, using dental records and DNA, a positive identification had been made. "Now we have two-thirds of his remains," Kenneth Elliot said. The second excavation also yielded more personal effects: an onyx ring, two keys, and some change. The family plans to take the onyx ring and have it made into small tokens for everyone in the family. "We've never had a funeral," Kenneth Elliot said. "We had a memorial service in 1982." More than three decades after the war ended for most Americans, they are planning a funeral for the spring. 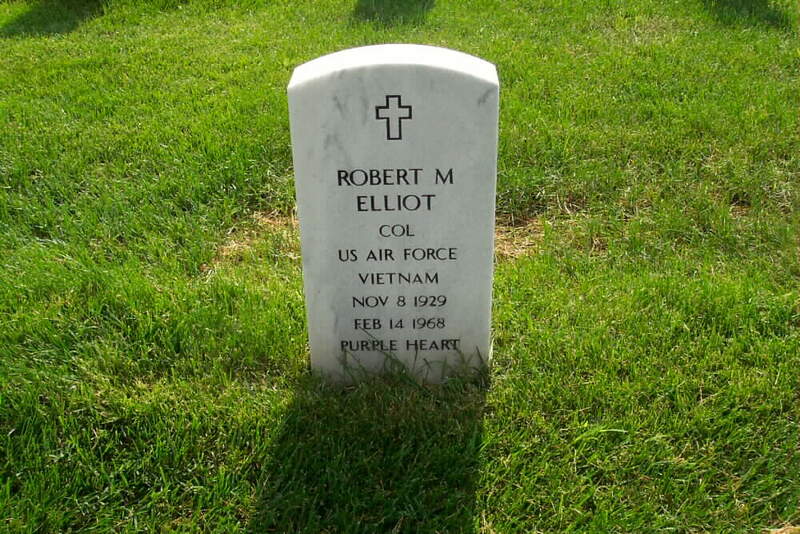 Colonel Robert M. Elliot's headstone in the Missing In Action section of Arlington National Cemetery will be buried with him at a new plot in the cemetery. With the accounting of Elliot, 2,031 Vietnam servicemen are still classified as missing in action. "I always remember him on certain days," Billie Elliot said. Especially, she said, on Valentine's Day.